Above is Sam the Eagle from The Raptor Project taken at last year’s New York State Fair. Sam is always perched fittingly in front of an American flag. One of my 5 Star Photos. Celebrating 233 years this Saturday, July 4th. 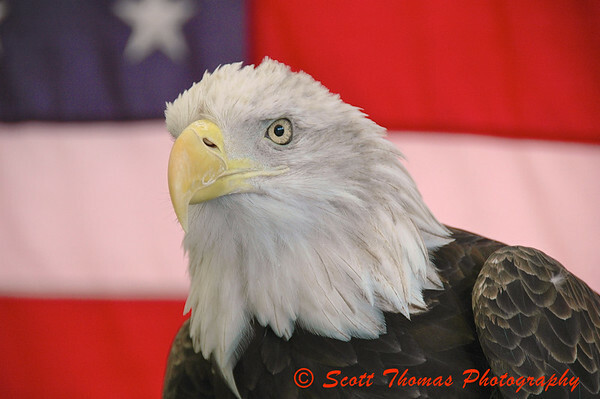 This entry was posted in Animals, Photography and tagged 4th of july, america, bald eagle, birds, new york, New York State Fair, Photography, raptor project, star rating, syracuse. Bookmark the permalink. Love pictures of eagles; I got one of these myself. Love this shot! What an awesome shot! It doesn’t get anymore patriotic than that! Hope you had a great 4th of July!